Hello readers.. In my previous post I shared coconut oil hair masks and today am here to share face mask recipe with you all. From the title you know that the mask contains coffee and clay. The smell of coffee is heavenly and it also soothes our mind. This mask is really addictive. Once you start using this mask you can’t stop using this on daily basis due to it’s aroma. This clay mask is more of a aromatherapy. It calms our mind and it also clears toxins from our skin. The ingredients of this mask is easily available and so you can easily make a batch for your self. This mask is my all time favorite. Rose essential oil – 2 to 6 drops. If you have dry skin then you can use white kaolin clay and skip red and pink french clay. If you have extremely oily skin then uses red clay and you may skip white kaolin and french pink clay. If you have normal to combination skin type then you may opt for french pink clay instead of red clay and white kaolin clay. Sensitive skinned beauties can choose between white kaolin clay and french pink clay. WHY I’M USING THESE INGREDIENTS? Consuming coffee on a daily basis is not a good idea but topical application of coffee has numerous benefits to skin. If you are someone who has scars on face then coffee helps you to clear those scars. I won’t promise you that it will clear out the scars within few uses but I will say that it fades those scars with few uses and clears it out with regular usage. For mature skin, coffee is elasticity booster. It improves elasticity of your skin and also delays the ageing signs. If you are in your late 20’s then this is the right time to start using coffee in your skin care regime. The aroma of coffee calms your mind which is added benefit. I personally use coffee to brighten up my skin. 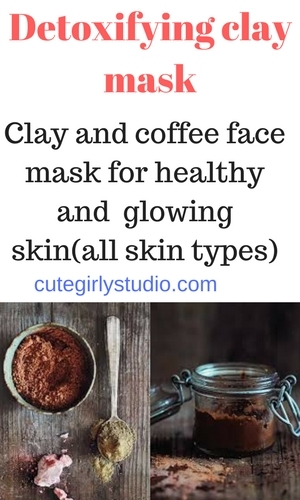 Coffee powder adds glow to your skin and it also brightens up your face. Cocoa powder is packed with anti oxidant properties that makes it ideal to use on mature skin. Cocoa powder repairs skin cells by fighting with free radicals which is responsible for ageing sign. It hydrates your skin. Dry skinned girls will find this extremely beneficial in this winter. Cocoa powder reduces redness and inflammation causes by acne. It helps to reduce the size of acne. Cocoa powder improves your skin complexion by making it brighter and clearer. 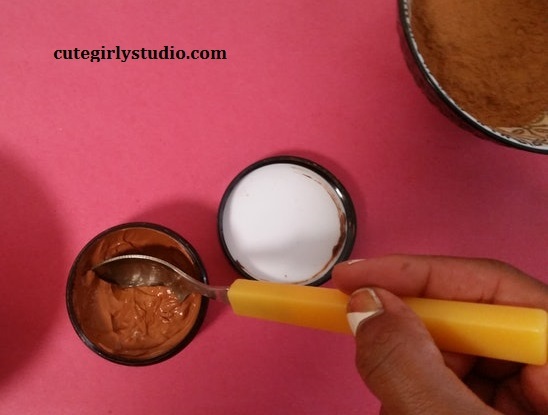 I personally use cocoa powder in this mask but it is optional, you can skip this ingredient. White kaolin clay is rich in aluminium silicate and silicon. This clay is the mildest of all clay available in the market. This has slippery and silky smooth texture. This doesn’t remove oils from your skin. Whenever we hear the name clay, we think that it draws moisture and oil from our skin. But this concept is absolutely wrong, there are clay that adds moisture to your skin. This white kaolin clay is extremely useful for people with dry skin. This has mild exfoliating property. White kaolin clay revitalizes the skin cells and also polishes the upper layer of skin with regular usage. This clay stimulates blood circulation like any other kaolin clay.This prevents appearance of wrinkles. It absorbs microbes and toxins present in our skin. White kaolin clay purifies your skin. French pink clay is rich is aluminium oxide. French Pink clay is a balanced blend of white and red clay. French Pink kaolin clay absorbs excess oil without stripping moisture from your skin. It also improves blood circulation and detoxifies your skin. It combats dryness and also unclogs your pores. This makes it perfect for combination skin type.Beauties with Normal skin type also find this clay beneficial for it’s balanced properties. French Pink clay softens your skin. Rose essential oil is antidepressant, antiviral and antiseptic substance. We often use rose water in our masks and DIY’s but rose essential oil has more to offer. Rose essential oil makes the scars and after marks of boils, acne, and the pox on the skin fade quickly. Topical application of rose essential oil purifies the blood. The anti depressant property of rose essential oil calms our mind. I personally use rose essential oil, but you can use any essential oil of your choice. Take the clay and coffee powder in a clean bowl. Now mix them well until they all are evenly mixed. Now add drinking water or rose water to the mixture. Add water until you obtain smooth paste like consistency. Now add few drops of essential oil to this and mix them. Transfer these to a clean and air tight container. Our clay mask is ready. Always store the container in refrigerator. Whenever you use this clay mask, try to use a clean spoon to take the product out. If you refrigerate this properly, this will stay good for 20 days. After cleansing your face apply this clay mask all over face and neck. Let it dry. When the mask is 90% dried, wash your face with normal running water. Follow it with moisturizer. Use this mask once a week to have healthy and glowing skin. The colour of the mask that you make may differ depending upon the clay that you use. You may also prepare also prepare this mask for single usage instead of preparing a batch. Let me know whether you like this mask or not. Follow me on Instagram | pinterest.